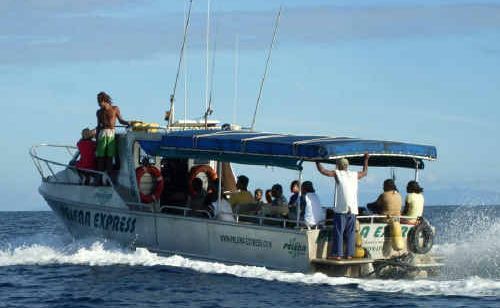 Pelena Express operates in the Western provinces of Solomon Islands. PELENA Energy, the small renewable-energy company based in Dorrigo, is helping to change thousands of lives in far-flung villages in Solomon Islands, Vanuatu, Papua New Guinea and Fiji. Managing director Peter Lynch said when he and his wife and business partner Selena Bryce established the company 13 years ago, they recognised that whether in the PNG highlands or on a Pacific island, the problems for remote villages were similar. And it was all to do with energy, infrastructure and transport. “We witnessed that normal development paths of delivering grid electricity, roads and communication to villages was not an option because of the difficulty of access,” Mr Lynch said. “We have approached the problem differently – instead of being an energy provider, we work with the community on a series of integrated activities. One example Advocate readers might remember was the 2006 story of the shallow-draft boat which Mr Lynch built in Dorrigo, and then sailed to the Solomon Islands as a way to create a reliable ferry service between islands and markets. “After five years the service is running reliably and has naturally developed into much more, such as providing emergency transport for the sick, being chartered for market needs plus it is totally operated and managed by village people,” Mr Lynch said. The original plan of the boat running off locally-grown and produced coconut oil has not yet occurred due to a lack of funding but may still eventuate. “The reason this works is because the village people have a strong loyalty to their family reputations plus we built the boat knowing spare parts would be needed – we have worked out ways through the communication difficulties to keep that connection there. With their reputation established, the Solomon Islands government and others are now approaching Pelena directly with village electrification requests. Pelena uses either micro-hydro, solar or coconut oil-powered generators to drive the local economies forward. Another Solomon Island project uses locally-generated electricity to make ice to freeze fish and preserve them so when the ship service arrives, villagers are ready with their fish in eskies and ice. Locally, Pelena hopes to expand sufficiently to allow them to develop micro-hydro on the Dorrigo Plateau. Mr Lynch said the Bellingen Shire Council had been very supportive and had offered to help Pelena navigate through the multitude of government agencies associated with such a development.